Haven’t posted anything since last month because I was distracted by other (let’s say) “projects” 😄 . But hey, now I’m back again. And this post will be the beginning of my traveling series, as I want to write some posts about Swedish cities I’ve been visited on April and early May 2017. I’ll start with Karlstad, then the capital Stockholm, then southern and east southern part of Skåne, especially Ystad, Simrishamn and Trelleborg. So, let’s start with Karlstad. Karlstad is a city in the Värmland province in Sweden, where Sweden’s longest river, Klarälven, runs into Sweden’s largest lake, Vänern. I went there during the Easter break at the beginning of April so it was supposed to be Spring but Sweden has that so called April Weather (when weather is so unpredictable) so it wasn’t that “springy” after all 😆 . We took the SJ regional train from Lund to Karlstad (with short transit in Gothenburg). In total, it was around 6 hours trip including the layover, but with scenic views during the trip and Wi-Fi on board, it felt like two hours. Haha. The symbol for Karlstad is a smiling sun as Karlstad is often associated with sunshine. Karlstad is indeed reputed to be one of the sunniest towns in Sweden. That’s why the slogan of the city is “Sola i Karlstad” (the Sun in Karlstad). Originally, it was referring to a beautiful girl working as a waitress at several inns in Karlstad named Eva Lisa Holtz. She was well known for her “sunny” and cheerful personality so she got the nickname “sola” which means “the sun” in the Värmland accent. Nowadays, the expression also refers to its reportedly sunny weather (Wikipedia). What to expect when visiting Karlstad? During my 4 days and 3 nights stay in Karlstad, I was expecting lots of sunshine and possible outdoor activities due to the city’s reputation. But with that April weather, when sunshine and rainfall conspire 😅, I must adjust my itinerary and change it on regular basis (whenever necessary). So when it was sunny I strolled around the city and the river and did outdoor things as much as I could (like playing in the playground because I was traveling with my kid or went to see the old bridge). Then, when it was raining or at least cloudy with a chance of rain, I went to museum, or café, or shopping centre instead. Well, the weather can be bad, and the rain can be annoying on April weather, but you must not skip the Klarälven River in Karlstad. 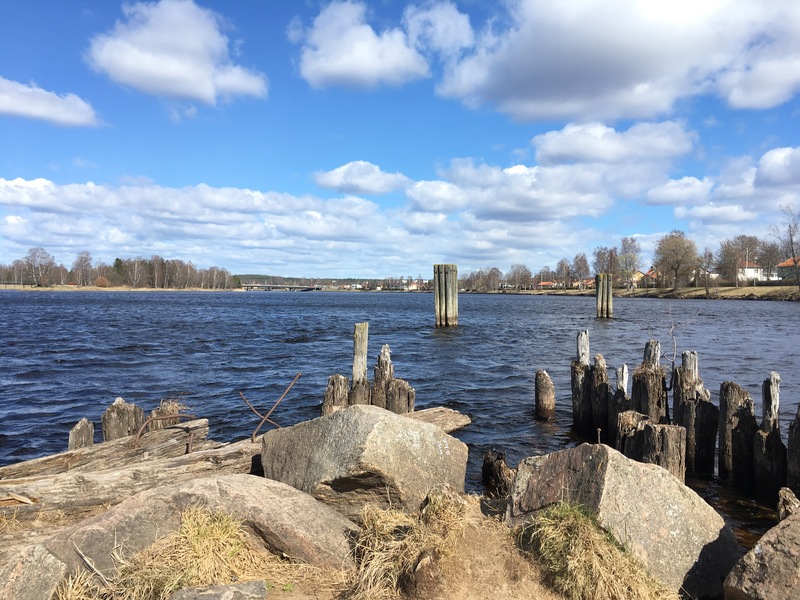 We were quite lucky because we had one sunny (but chilly) day during our stay in Karlstad, so we could walk by the river and enjoyed its breathtaking and contemplative scenery. Translated as “The Clear River” in English, Klarälven has clean water indeed, makes it suitable for bathing (although caution must be taken if bathing at a point before the river reaches its delta, as the currents can be dangerous). It is a river that flowing through Norway and Sweden, which historically provided significant economic benefits, such as providing a suitable transport route for log driving and currently is internationally recognized as excellent sport fishing waters (Wikipedia). On summer, you can also rent kayak, or canoe, or take a tour to explore the river. As for me, what I did was just sat by the river, enjoyed the view and the sound of the flowing water. It felt so relaxing. The old stone bridge, with its 12 arches, is the country’s longest Stonebridge and one of Karlstad’s most popular photographed locations (source). It is very good as a background picture indeed. The bridge was built in 1761 and completed in 1811, but still used until now to connect one riverside to another. You can also go to under the bridge, when the tide is not too high of course, to see the stones’ construction in details. When visiting someplace new, I try to avoid those chain coffee shops I can easily find in Lund like Espresso House or Wayne’s Coffee. Not because their coffees are not good (theirs are very good in fact) but for me, it’s important to experience new things during a travel. So when I was in Kalrstad, I tried the local café called Carli Glass, Choklad & Cafe. It was a nice café located at the heart of the city. I tried the coffee, the cheesecake and the ice cream there and they were all tasty. The café is bit busy (I assume because it’s quite popular) and bit hard to find a seat but it’s worth the queue. Actually, travelling in Swedish cities is quite easy in terms of itinerary because all cities have what Swedes called as “stortorget” or literally means “the big square” (just like “alun-alun” in Indonesia) and the main attractions in the city, usually are just around this square. So, when you go to a city in Sweden, try to find the stortorget first and it will lead you to other attractive places like monuments, library, museums, town hall, cafes, cathedral, shopping centers, and so on. This also applies to Karlstad. Start an afternoon stroll in Karlstad with stortorget and in few meters you will bump into the town hall, the cathedral, the shopping centers, and the monuments of prominent events/persons in Karlstad including the monument of the “sunny” girl: Eva Lisa Holtz.